Restaurant-style wrap with crispy chicken tenders tossed in buffalo sauce, cold lettuce and tomatoes and smoky bacon. When you go to your neighborhood restaurants - you know, like quick, casual places, nothing too fancy, good food and big portions - do you have a favorite thing to order or do you always try something new? I love trying new things, but at some restaurants I have a favorite dish and order it every time we go. A local bar and grill has a chicken wrap on their menu that I just LOVE. 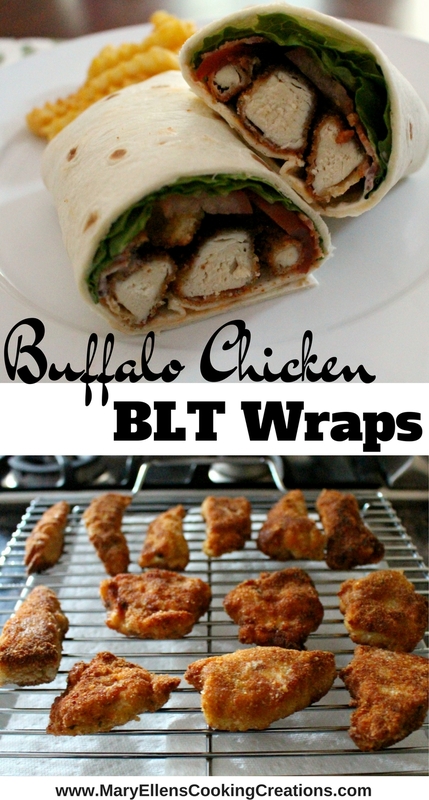 It's a pretty straight-forward wrap with buffalo chicken and veggies, so I decided to recreate it at home. I added bacon though because, well, bacon!! I fried up the chicken while the bacon was cooking, and that's pretty much all the prep that goes into this dish. 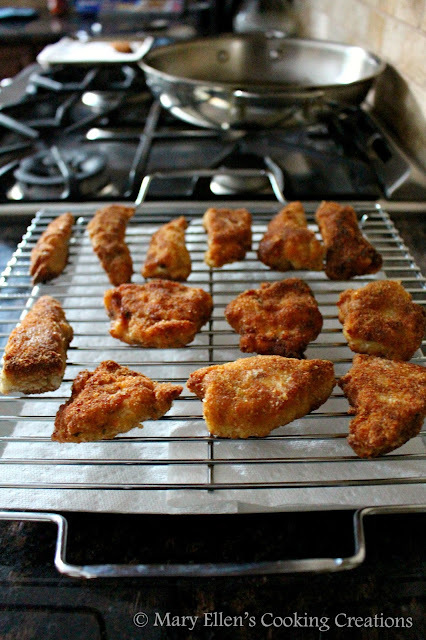 My key to crispy chicken tenders with breading that stays put intstead of sliding off the chicken when you take a bite is simple. Cornstarch. Instead of using flour as your first breading step, use cornstarch. Your breading will stick to your chicken in a thick layer and won't go anywhere when you cut it or take a bite. Look at how beautifully crunchy and crispy that chicken looks! 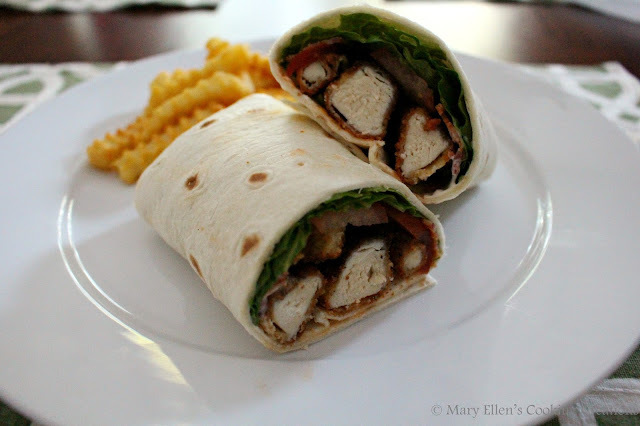 Once the chicken and bacon are cooked, you simply layer your wrap with greens, bacon, tomatoes, and the chicken tossed in buffalo sauce. Drizzle on a little ranch dressing and wrap it all up. 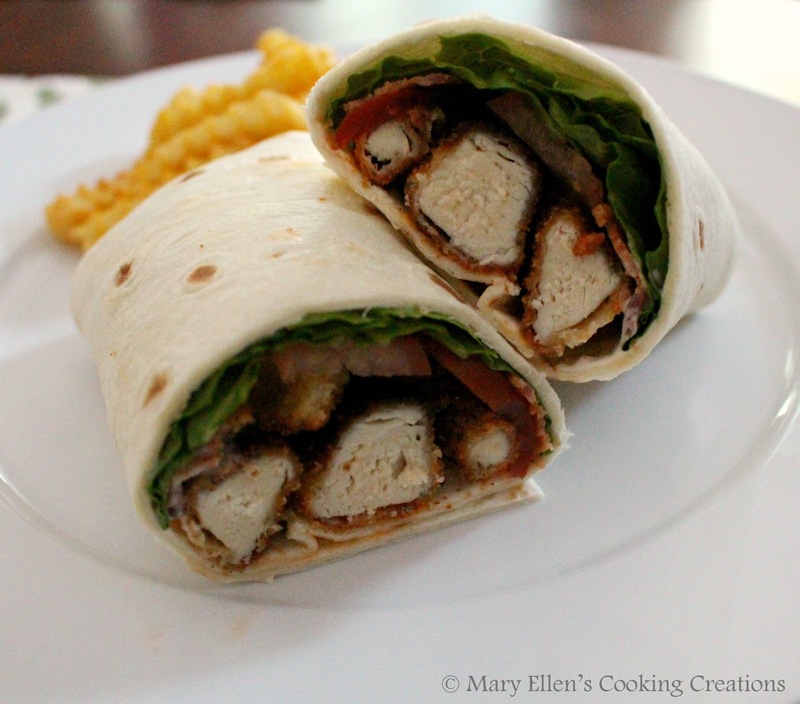 For a pub style meal at home, give this chicken wrap a try! - Set up your breading station: put cornstarch in first bowl, beaten eggs in second, and breadcrumbs seasoned with onion and garlic powder in a third. Place paper towels on a large plate and top with a cooling rack. 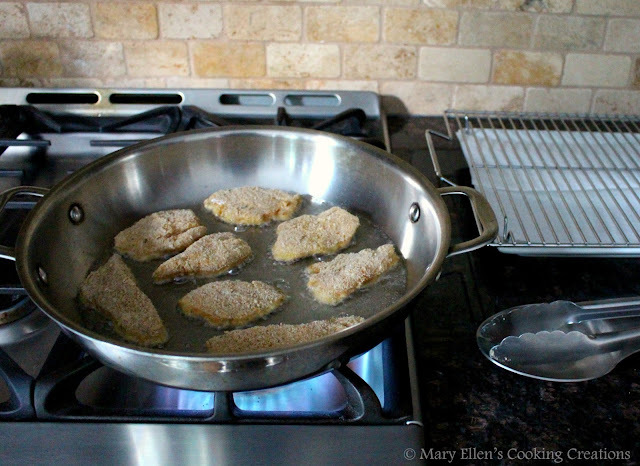 - Heat oil in a large saute pan over medium high heat - Season chicken strips with salt and pepper. Roll in the cornstarch, shake off any excess. Coat with egg and then roll in the breadcrumbs, fully coating the chicken. - Place the chicken in the pan and fry for 4 minutes until one side is golden brown. Flip and brown the other side for 4 minutes. Check temperature - chicken should reach 170 degrees. Cook until the chicken is at the correct temperature. Transfer to the cooling rack. - Toss the chicken with buffalo sauce - Assemble the wrap by layering greens, bacon, tomatoes, chicken and some ranch dressing. Fold in the ends and roll, tucking the ends in as you go so you end up with a nice, tight burrito shaped roll. Slice in half and serve.